There’s a lot to learn from the study of human behavior. Fields like psychology, sociology and behavioral economics have given us volumes of research that shed light on how we make decisions and what guides our behavior. Much of this research can be directly applied to our design processes to help build experiences that people will love. Graphing data is surprisingly difficult. It’s easy to dump data into Excel and create a basic chart. That’s not difficult, and that’s what you’ll see from most people - even seasoned analyts who know how to crunch numbers. But the art of effectively communicating through data visualization is a valuable skill on its own right. And I don’t just mean complex, interactive visualizations or giant infographics. Simple graphing also falls under the umbrella of data visualization, and most people don’t give it the respect it deserves. With that said, I want to dissect a chart I came across tonight. 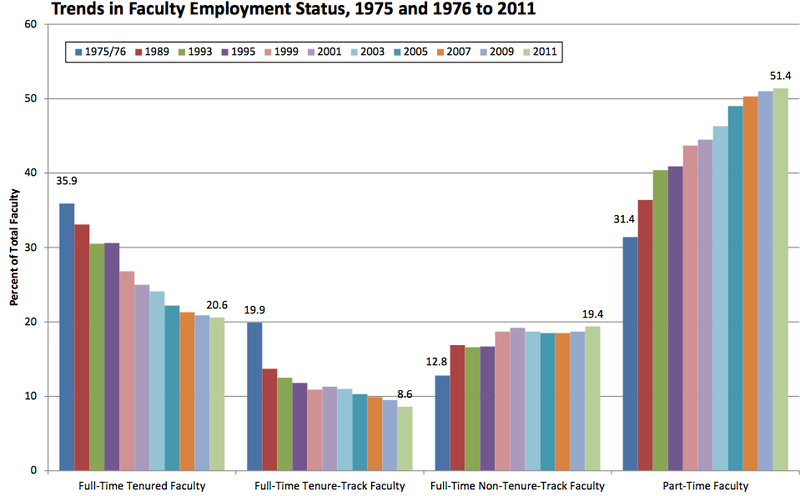 The data comes from the AAUP and hat tip to Yoni Appelbaum for bringing it to my attention. It tells an interesting story, but it’s a little difficult to parse at first. You can have the best product in the world, but it could be getting filtered out the conversation without you even knowing it. You could be losing clients, losing sales and hurting your business because of factors that you’re not even aware of. How to combat this? Understand what filters your target market uses in their decision-making, and position your product to make sure it’s not getting filtered out too early. Here’s a quick story to help illustrate how this works. If you’re anything like me, you spend a lot of time putting together research decks. Despite the naysayers who shun anything related to slide decks, they’re often the most practical way to convey your ideas. As long as they’re done well – a task that’s easier said than done. For charting, the default Powerpoint options aren’t great and are usually full of chart junk, but they do allow pretty full customization. Contrast that with Keynote, which offers great defaults but is much harder to tweak to your liking. But even without the full customization power, I nearly always find myself gravitating toward Keynote. And now that I figured out this new graphing hack, I have one less reason to consider booting up Powerpoint. Subscribe to the mailing list. Absolutely no spam, just great original content on product development, delivered to your inbox.